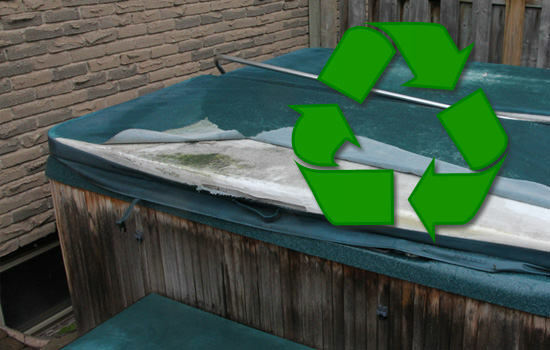 You’ve just received your brand new, beautiful hot tub cover from The Cover Guy… but what to do with the old one? The old cover is big, heavy, stinky, and full of mildew and mold. So the first thing you want to do is put on some gloves! Then you have to decide whether you are going to take a trip to the dump and just recycle, or find a place to reuse some or all of the hot tub cover materials around your home. 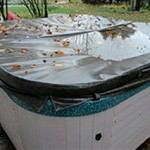 This short guide will give you ideas for disposing hot tub covers. Use a knife or box cutter to cut and split the middle seem of the cover into two halves. Locate the zipper on each half and unzip. Remove the hot tub cover foam inserts. Be mindful that some of the foam will be broken and it may also be very heavy from accumulated moisture. Cut the vinyl into smaller strips if necessary and throw away unless your local recycling center or landfill accepts vinyl. Alternatively, reuse the vinyl (see below for ideas). Remove the protective plastic vapor wrap, if necessary, and throw away. (This wrap may not be present). Remove the metal or aluminum channel from the foam inserts. Place these items into the metal recycling bin at your nearest landfill or recycling center so they can be broken down for another use. Alternatively, reuse the metal at home (see below for ideas). Cut the foam into more manageable pieces and take it to your nearest landfill and place it in the foam recycling. Use the metal for tomato plant stakes. The foam can be used as filler under ice rinks in the winter. Use the vinyl as a cover for your grill and other outdoor furnishings. Do you have any additional ideas on how we can reuse the vinyl or metal channels?